The Miracle Of Your Voice - Class 1 - Registrations consists of two versions of a class that both use practical, accessible exercises and plenty of feel good about your voice moments to encourage a positive and affirming learning experience. The classes are suitable for all and cover the basics of good posture for singing and speaking and the three vocal registrations of your voice. The 40 minute version contains a gentle physical warm up followed by a number of effective vocal exercises that will give you a, 'feeling sense' of making sound with playfulness and without harsh self-criticism. There is also an additional 10 minute 'quick reference' version of the practice, for the days when you have less time, which summarises the key points and exercises within the main class. Both classes are devised and instructed by Barbara Ann Grant, an exceptional vocal coach, classically trained mezzo soprano and sound healer. Barbara's engaging teaching methods will improve the way you use your voice and also your levels of confidence and self-esteem. 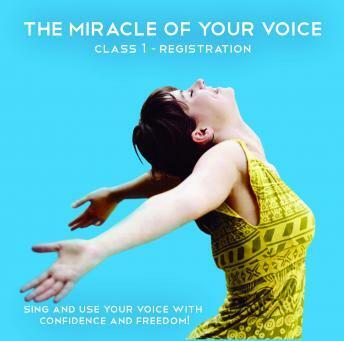 The Miracle Of Your Voice - Class 1 - Registrations is accompanied by a free PDF guide book that gives reference photo for each exercise and lots of supporting information on the voice.